Is it compulsory to use FDA-approved products for everything we do in the food processing industry — for example hand gloves, cleaning wipes? Which standards should the food processing industry follow when it comes to cleaning wipes or hand gloves? The Food and Drug Administration (FDA) and the U.S. Dept. of Agriculture (USDA) are the primary approvers of products used in the food processing industry. Any overlap usually deals with the issue of the product being a processed food versus an agriculture product. Meat and dairy as well as raw materials that are primarily agricultural commodities are governed under the USDA. Food processing facilities that use pre-processed ingredients are the focus of the FDA. As a result, most food processing facilities are visited by both agencies. Since the FDA is part of the U.S. Dept. 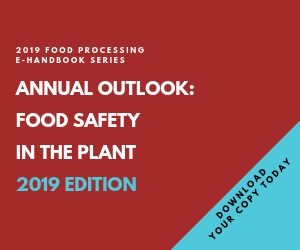 of Health and Human Services, some people view the FDA as the agency focused first on safety then sanitation; while the USDA deals with basic raw food materials and may be view as focused on sanitation first then safety. This is perhaps a simplistic view and one the agencies might dispute, but those are practical ways to differentiate. Regardless of the viewpoint, both agencies are concerned with food processing safety and sanitation issues. Therefore, it would be recommended that your hand gloves and cleaning wipes have the approval of both agencies. Work with your primary agency to gain approval for your gloves and wipes and they will direct you to the appropriate contacts within the second agency.